Oh, yes. Back in November Sam got a lead that took him to a basement where something really strange happened but we don't quite know what yet. And Sam's dad shot him. So, then ABC doesn't schedule any further episodes until this week. Do we get any inkling of the previous events in new episode Take A look At The Lawmen ? No, we effing don't. Talk about stringing us along and then pretending nothing important happened back in November. Still, it's actually rather comforting to have the U.S versions of Sam, Gene and company back. The story again mirrors an original UK episode (the rivalry between Gene and Harry Woolf in the first episode of Series 2) but manages to take the similar relationship between Gene and Lt. Anthony Nunzio and spin this out into a more detailed and personal story of how both of them loved the same woman and Nunzio has held a long-running grudge against Gene Hunt for succeeding in marrying her. It's a well played, slightly sentimental story and offers Harvey Keitel some particularly good opportunities to further flesh out his version of Gene, show his vulnerability and tenacity. The competition between the two police officers and their precincts to solve a bank robbery and murder is more or less played as farce. The opening sequence, where Gene and Sam are trying to talk down a would-be suicide from a window ledge, even goes for very black humour. After a few jokes about mobile phones, Nunzio arrives and brags that he can use reverse psychology on the poor man and get him down. Yelling at him to jump actually has the unintended but desired effect - he jumps and kills himself. This comedy is eventually taken to some rather silly extremes. 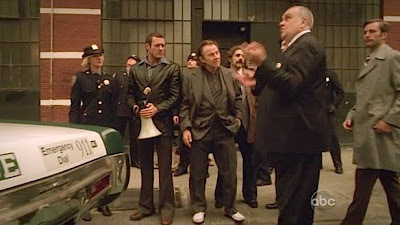 The bank robbery is tied in with a mob of Russian gangsters (perhaps some comment on the black market regime of the oligarchs in the present day Russian Federation) and there is a great deal of rather talky, slow paced scenes in the episode and the comedy gives it a feel of Prizzi's Honour but one lacking in much charm or sophistication. The confrontation between Gene, Nunzio and the Russians turns into a fist fight around and in a swimming pool to the strains of Thin Lizzy's 'Whiskey In The Jar', not in itself a bad match, but you are left feeling it would have been so much better to have re-capped on the strange events of Episode 7 than spend a whole episode gearing up for a comedy fight in a pool. There are some splendid locations to compensate - the pool area is a lavish rococo affair as is the rather splendid building for the bank robbery. More successful was the attempt to give Sam some love action. Social worker Maria Belanger, spikily played by Maggie Siff, doesn't beat around the bush when it comes to fancying Sam. Sam actually gets laid! And he clearly enjoys it, much to the annoyance of Annie who then spends most of the episode figuring out her relationship to Sam. The conclusion to this love triangle is a bluff - Annie attempts to tell Sam something, we assume she's going to confess her love for him, but then Maria's dad turns out to be Gene himself and thus Annie's actually trying to impart this to Sam. It's a good twist on the relationship and the timing between Gretchen Moll, Jason O'Mara and Siff is spot on. Perhaps the best scene in the episode. 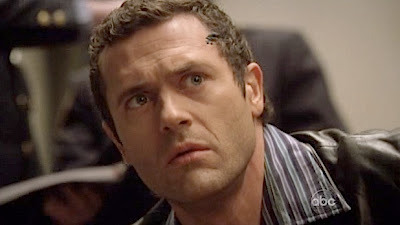 Jason O'Mara is as strikingly handsome as ever and his 'innocent abroad' take on Sam Tyler is very appealing and he's fast become the backbone of the series along with Keitel. There are still strange little moments involving miniature robots popping out of corpses in the street and from under the skin of a suspect he's interviewing that seem to have a connection the 'soul' of Sam Tyler and how it is still chained to the present day. Michael Imperioli is improving each episode and this is perhaps his most rounded performance as Ray. Jonathan Murphy gets a few more lines as Chris but the series is still not building up the double-act between Ray and Chris that made the UK series such fun. If they're trying something different then their tendency is to leave Chris on the sidelines in the U.S series. So, not a terribly exciting episode to re-open the season with and that's not going to help the series in the ratings. It's slow, the bank robbery plot never really engages and the comedy is often misplaced. A shame because all the performances remind us that they've got a pretty good ensemble cast who do their best to try and make scripts like this one work. Not even their efforts can save this from being dull.